Should You Do an ICO? "Imagine that a friend is building a casino and asks you to invest. In exchange, you get chips that can be used at the casino’s tables once it’s finished. Now imagine that the value of the chips isn’t fixed, and will instead fluctuate depending on the popularity of the casino, the number of other gamblers and the regulatory environment for casinos. Oh, and instead of a friend, imagine it’s a stranger on the internet who might be using a fake name, who might not actually know how to build a casino, and whom you probably can’t sue for fraud if he steals your money and uses it to buy a Porsche instead. That’s an I.C.O." ICOs are kind of like blockchain-based Initial Public Offerings (IPO) or crowd-funding campaigns. The IPO analogy works because, with an ICO, the company offers tokens or coins in exchange for some value, somewhat similar to an IPO where people buy shares in a company. However, IPOs are considered to be an offer of securities or equities and are highly regulated. It's not really clear what ICOs offer and how they should be treated. A better analogy for an ICO might be a crowd-funding campaign, where contributors provide the funds required to build the proposed product or project. In return, the funders typically receive tokens that provide some kind of utility. The process takes place through autonomous smart contracts on a blockchain, typically Ethereum. These tokens can usually be traded on online cryptocurrency exchanges once the token sale period has ended. This is what makes it somewhat different from a traditional crowd-funding campaign, since it seems that many contributors buy tokens in the hopes of selling them at higher prices later on. According to the NYT, as of late 2017, more than $1.7 billion (USD) had been raised through ICOs since January 2016, and one ICO managed to raise $35 million in just 24 seconds, another recently raised more than $200 million in just 60 minutes. Coindesk tracks ICOs in near real-time here. From an entrepreneur's perspective, ICOs are great because it's a way to raise early stage funding without any loss of equity or taking on any debt. It doesn't get better than that, right? Maybe. But, from a contributor's perspective, ICOs are really risky because there are no regulations and no guarantee on any return or future value. That may be changing, however. The amount of activity and the amount of money raised recently means that ICOs are being increasingly scrutinized. If you're an entrepreneur considering an ICO, make sure to do your homework and get a good lawyer. There are several cautionary tales out there - one is Tezos, a blockchain startup currently watching securities class action lawsuits pile up over the company's $232 million initial coin offering. To find some ICOs worth researching and watching, check out this post. 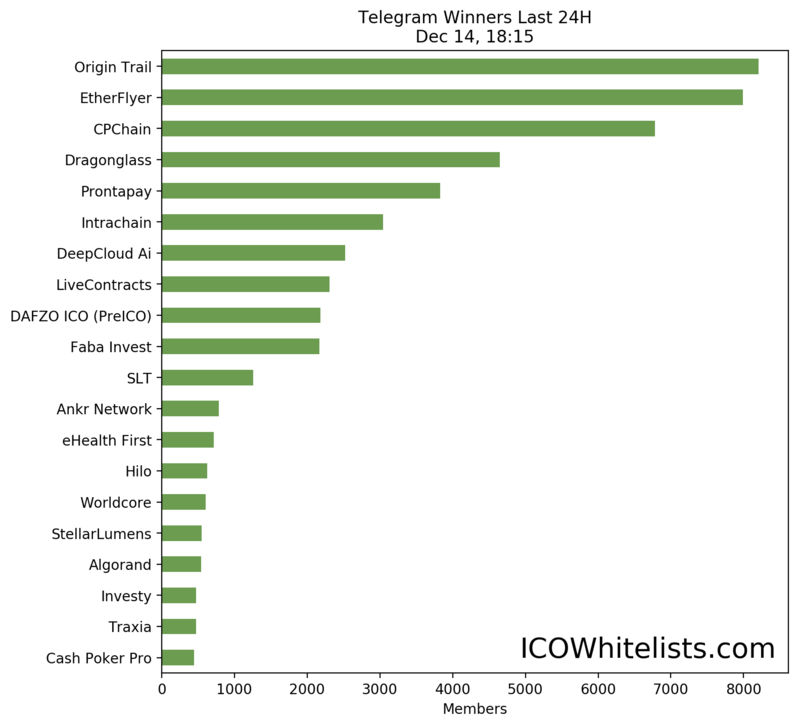 Interestingly, Telegram is widely used among startups doing ICOs and if you track the number of Telegram members in a startup's group, you get a pretty good idea of how hyped up it is and maybe also it's value. From an energy blockchain perspective, two prominent companies in the energy space had very successful ICOs in 2017 -Power Ledger in AU, and Grid+ in the US. If you are interested in either of them, check out this post comparing the two ICOs and their processes. Earlier this year, US SEC officials said that companies issuing tokens to raise capital have a responsibility to protect their investors. "ICOs that are offering investments must register with the SEC. However, they also point out that certain exemptions may apply. In some cases, if a token is not a security, but instead has an actual utility, then the ICO (Initial Coin Offering) may not have to register with the SEC since that would not necessarily be considered an "investment" or security. They have not released detailed explanations of exactly what would or wouldn't be considered a security, but only commented on The Dao." More recently, Joshua Ashley Klayman and the Third Web put together a very interesting podcast on the current state of legality of ICOs. The Third Web is great and Joshua Ashley Klayman is worth following on LinkedIn. She's very plugged into what's happening with blockchain and legal issues, and participates in all of the important groups and activities in the space. Another recent datapoint is from the ICO Financing Conference put on by Blockchain at Berkeley. Blockchain at Berkeley is a student run, independent organization dedicated to the crypto and distributed ledger space. The team consists of undergrad students from a wide range of majors who are very knowledgable. Though Laura Shin reported for Forbes that many at the conference were disappointed that the SEC officials at the conference did not provide much clarity to those interested in holding ICOs, it's still worth reading the report to understand their current point of view. If you haven't been following Laura's podcast, Unchained, now is the time to start. So, in summary, it seems unlikely that ICOs will continue to be no-strings-attached easy-money for long. If you're thinking about doing an ICO, go for it, but do it the right way and for the right reasons. This post by Omri Barzilay outlines four key tips to keep in mind if you are going to go for it. What is Power Ledger's Play?